This is really just breaded boneless chicken breast with salad on top. Not too many ingredients involved so its really easy. I use cornflake crumbs, but you could use panko, mashed potato flakes or any kind of crumbs, even crushed pretzels or tortilla chips. But then its not italian. 🙂 As for the salad, make whatever you like. 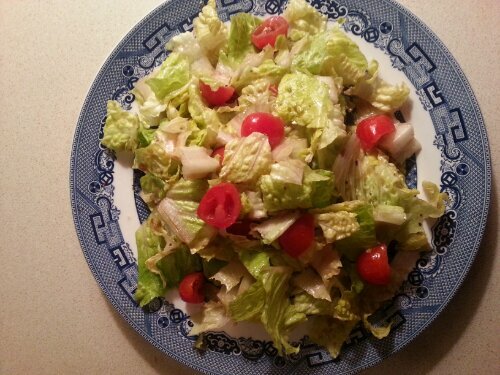 Mine just has tomatoes, cukes and romaine with homemade balsamic-honey-mustard dressing. 1. Put the crumbs in a pyrex pie plate. 2. Beat the egg and pour into a second pyrex pie plate. Add the lemon juice and garlic powder to the egg. Stir. 3. Pound the chicken breast (scallopini style). Butterfly the chicken if its too thick before pounding. 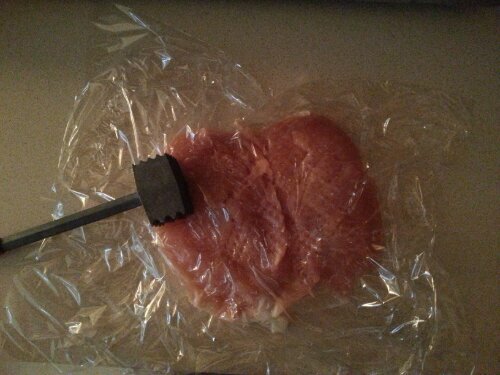 I put the chicken between two sheets of plastic wrap, then pound. 4. 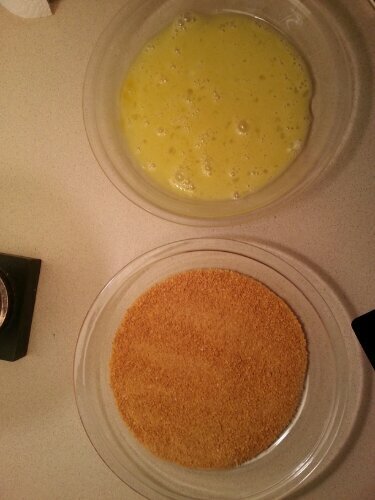 Dust the chicken breasts with flour, then dip into the egg and then dip into the bread crumbs. Place chicken on foil lined pan. 5. Bake at 400° for 30 minutes. In a small pitcher or glass, mix together 1/2 cup extra virgin olive oil, 1/8 cup balsamic vinegar, 1 tablespoon honey, 1 teaspoon dijon mustard, a dash of garlic powder and dried oregano each. Dress salad greens. 7. When the chicken is done simply place the chicken on the plate. Then place some salad on top and serve. 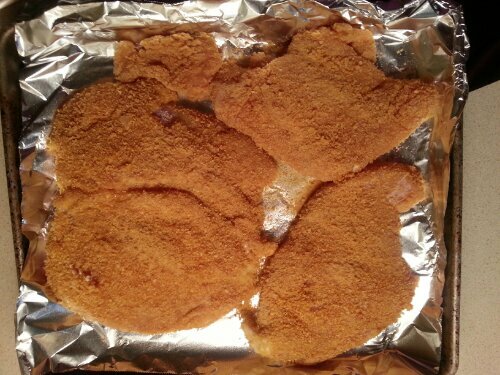 This entry was posted in dinner, food, poultry, recipe and tagged #bonelesschicken, #breadcrumbs, #chickenmilanese, #cornflakecrumbs, #crumbs, #dressing, #italianrecipe, #kosher, #kosherrecipes, #milanese, #scallopini, chicken, dinner, recipe, salad. Bookmark the permalink.